NOTE: This giveaway is now closed. Congratulations to Mary R. and thanks to all who entered. Stay tuned for more gfe-style giveaways! If you follow blogs, you know that bloggers can bring home a lot of swag from conferences. In fact, I’ve had to ship home my swag from the ones I’ve attended. My one carry-on suitcase is already quite full when I arrive. After all, a girl has to have a variety of outfits. And, shoes … don’t forget the shoes. So there was no way I could add another thing to my suitcase and pass the inspection of the gate agent. Some Bodum goodies were in my swag from the recent International Food Bloggers Conference and another came from BlogHer Food from last year. Don’t worry … they’ve all been stored away. But since I’m not going to use any of them, I thought it would be fun to share. What are the items? For the coffee lovers, there’s a French Press Brazil Cafetiere ( 1 1/2 cups in US measurements) and a Bodum Mini-Press for travel. 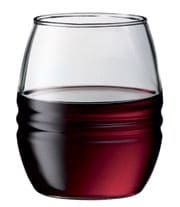 There’s also a stemless wine glass—a spiffy tumbler—that’s designed to go in the dishwasher. That means no standing up at the sink and washing a fragile wine glass after imbibing … nice!. Interested? Just leave a comment to enter. If you’d like additional entries, you can “like” gfe on Facebook, follow me on Twitter, tweet, share this giveaway on Facebook, or share this giveaway in a blog post. Leave a comment for each one. The giveaway will be open until Saturday, September 18, at midnight Eastern. LOL I can just imagine trying to stuff a ton of swag in suitcases and carry-ons. I shop a lot when we visit my hometown and packing is always interesting. My husband even made a bet with me once that I couldn’t fit everything in the suitcases and box we had to check in. He learned never to bet with me when it comes to space management! I loved your description about trying to bring everything home. I’m guilty of not only bringing multiple shoes, but multiple purses as well (my husband thinks I’m crazy!). Hi there, Mir–So nice to see you! 🙂 Yep, if you like your coffee, the Bodum coffee tools would come in handy. 😉 Then you’d have some excellent coffee to use in your ice cream! Cool stuff! I love coffee and am sipping some now. The ice cream sounds divine! I would be in heaven with all that swag…and with all you bloggers! I can’t wait to make your coffee ice cream…I’ve got 2 cans of coconut milk in the frig just waiting for a new recipe! Hi Loflin–Nice to see you here at gfe again! :-)The swag can be pretty impressive. We’re all just normal people, but we’re enthusiastic and caring. There’s an amazing amount of energy at those events! You are such a lucky gal – all that swag! Anxious to try your ideas on my g/f and insulin dependent granddaughter! Love your site! Hi Mary–How nice to see you again! 🙂 Yeah, the swag can be a lot of fun. Finding out I needed things that I never even knew existed. 😉 Many thanks for your kind words, Mary! I hope you’ll find the help you are looking for here. Please shoot me an email if I can be of further help. I am so glad that I found your site. After reading your blog I went right to Facebook and “liked” you! I want all of my friends that have Celiac Disease like my family to find you too. We are always looking for information! I would love to win your give aways too! What a great thing you are doing for those of us in need. Keep up the great work! Hi Beth–Welcome to gfe! 🙂 Thanks very, very much for the kind words, FB connection, and sharing gfe with family members. I truly hope you’ll find the info and recipes you need here. Let me know if I can answer any specific questions/concerns. Just found your site through Celiacs in the House…and can’t wait to try the coffee ice cream recipe! Thanks for letting us have a chance to win your wonderful swag! I have already “liked” you on Facebook. You are so sweet to give these away! I also leave conferences usually having a suitcase WAY too heavy to ship back, so sometimes right in the airport I will end up giving away some freebies! These are amazing freebies, wow! I press my own coffee quite a bit, especially when I have guests over. It’s always so fun to use with company more than just a coffee pot. I also use the stronger pressed coffee for baking (adds great flavor to anything chocolate). Yes to no hand-washing wine glasses! I’d use this alongside the pork chops I have marinating from your recipe a while back! Yumm! Can’t wait! I’m just visualizing you giving away stuff in the airport. I would certainly do that, although unfortunately it would probably be suspect these days. Cool for you on making your own pressed coffee. I’d like to try it in this recipe … maybe add some cocoa to the recipe, too. Yum. Well my Dad basically lives for chocolate, so I KNEW he would love your rich chocolatey cake recipe…and he is not a big guy (so he needed it! but shh, dont tell him I said that) HE LOVED IT! It turned out beautifully too. The raspberries were perfect on top. I got LOTS of compliments. Even my grandparents were impressed by me, thanks to you!! I love being able to serve gluten-free meals and/or desserts that don’t compromise everyone elses’s pallates just because I have to eat gluten-free. No one even came close to a complaint, and everyone was completely satisfied after the meal. Funny thing is that I served it with coffee-flavored ice cream…should have made my own, right? 🙂 Next time! Thank you so much again. By the way, I might have to have the coffee, oatmeal marble squares, and the coffee ice cream ALL together! with wine to follow, of course. The wine glass is pretty! Thanks for entering the giveaway! And, no, please don’t mention that you are one of those awe-inspiring girls who can live for days with just a small sampling of clothes. LOL And, no doubt you looked sensational the whole time, too!! Good luck! and i don’t know about looking sensational-in my pics it looked like i never changed my clothes lol and i would gladly trade my packing skills for your blog ones! your hard work helps us all and i’ve no idea where you find the time-but am glad you do 🙂 hugs! Woohoo on making the coffee ice cream and you and your sister enjoying it so! You are in the running for the world’s best sister award, you know that, right? 🙂 I know your sister truly appreciates you looking out for her all the time with her food restrictions. And, sharing ice cream … well, that’s just a required sister thing, I think. It always has been in our family! Coffee ice cream is my favorite flavor. And seeing this post made me excited and sad at the same time. Both of my french presses broke during the move across country. So now I am using an old coffee pot that my dad gave me, which is also broken but at least this one still is functioning and not shattered in little pieces! For the one conference I went to, I was told to allow room for swag so I checked a suitcase as well as took a small one on board. (I packed a lot of food since there wasn’t much I could eat there.) I would love to take any of these items off your hands. Thanks for offering them as a giveaway. can’t wait to try the coconut milk ice cream! I have a very loving relationship with coffee. Dressing it up in fancy glasses and a press will only make our time together that little bit more amazing. And…I will be trying you coffee ice cream this week. Hope you enjoy this ice cream, and best of luck on the giveaway! Looks like I finally found the perfect place for all the recipes I’ve needed. Thanks for the extra boost to help me stay gluten free!!! Hi Tonia–Welcome to gfe! 🙂 What a nice thing to say, too. Thank you! I hope you’ll find everything you need … please let me know if there’s something in particular you are looking for and can’t find. 😉 I definitely want to help you stay gluten free! That’s the whole concept of gfe … keeping it easy, plus healthier and more economical. What fun and how nice of you to share! I’ve always wanted to have one but just haven’t done it. Hi there Therese–What a pleasant surprise to have you pop on right at the last moment! Up late waiting for Mr. GFE to return from his trip. 🙂 You would love these! I love coffee and wine! I love your blog too! I follow you on facebook, and twitter. Ooooo my boyfriend is a coffee connoisseur and he’s always trying to get me interested. This would be the perfect thing! Oh – fun stuff! We’ve broken several French presses in our house. A back up one (and travel size!) would be so excellent. Hi Deanna–Nice to see you again. 🙂 Thanks for expressing an interest in the giveaway; unfortunately it already closed. For some reason, my first update showing that info didn’t get saved—so sorry! I hope you’ll come back for future giveaways. 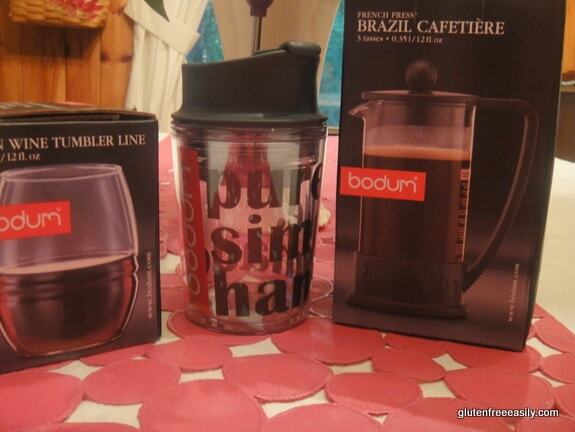 Received my Bodum products – can I say “WOW!” Thanks so very much. Your blog has helped immensely with ideas for my g/f and diabetic granddaughter. Many, many thanks! 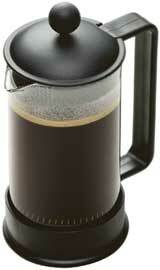 Hi Mary–I’m so thrilled that you are pleased with your Bodum products! Thanks for taking the time to let everyone here at gfe know. 🙂 Thanks, too, for your kind words on gfe as far as helping your granddaughter. Knowing that makes my heart sing … truly! I hope you’ll continue to find gfe helpful as I share more and more of the recipes, discussions, and products that work for my gfe approach.